A 70-year-old male with a history of hypertension presented to the emergency department with acute-onset right upper quadrant pain described as constant and sharp. 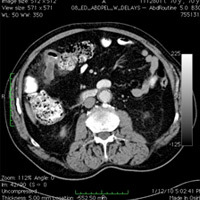 The initial workup included a CT of the abdomen and pelvis with IV contrast. Imaging prompted surgical intervention. Contrast-enchanced CT of the abdomen and pelvis demonstrated a dilated, tubular blind-ending structure arising from the terminal ileum.� Associated mesenteric inflammatory stranding was noted.� A normal appendix was identified. Meckelâ€™s diverticulum (MD) is the most common congenital anomaly of the gastrointestinal tract, with prevalence approaching 2%. MD is essentially the failure of omphalomesenteric duct regression. 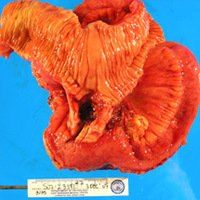 A Meckelâ€™s diverticulum containing a carcinoid tumor is even more uncommon, with only 111 reported cases in the literature.1� Neoplasms such as benign lipomas,2� adenocarcinomas,2,3 gastrointestinal stromal tumor,4 and signet-ring cell adenocarcinomas are also found5 within MD on rare occasion. Clinical features range from an acute abdomen with severe gastrointestinal hemorrhage and/or perforation to chronic symptoms of obstruction and anemia. Workup may include barium studies, abdominopelvic CT or MRI, laparotomy, Meckelâ€™s scan (99-m-technetium-pertechnetate), and/or digital subtraction angiography of the superior mesenteric artery, which in 10% of cases leads to the discovery of a vitelline artery supplying the MD. â€” Dhiraj Rajkumar, MD, is a radiology resident at St. Barnabas Medial Center in Livingston, N.J.
â€” Cornelius S. McCarthy, MD, is president of Imaging Consultants of Essex and a member of the radiology staff at St. Barnabas Medical Center. Schwartz SI, Fischer JE, Daly JM, Shires GT, Galloway AC. Principles of Surgery. 7th ed. New York: McGraw-Hill; 1998. Dumper J, Mackenzie S, Mitchell P, Sutherland F, Quan ML, Mew D. Complications of Meckelâ€™s diverticula in adults. Can J Surg. 2006;49(5):353-357. Green M, Oratz R, Muggia FM. 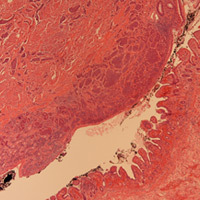 Carcinoid syndrome from a tumor of Meckelâ€™s diverticulum. Am J Med. 1987;83(1):184-186. Hager M, Maier H, Eberwein M, et al. 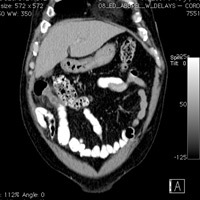 Perforated Meckelâ€™s diverticulum presenting as a gastrointestinal stromal tumor: A case report. J Gastrointest Surg. 2005;9(6):809-811. Lippe P, Berardi R, Latini L, Bracci R, Cellerino R. Severe prognosis of signet-ring cell adenocarcinoma occurring in Meckelâ€™s diverticulum. Ann Oncol. 2001;12(2):277.